Do Ho Suh’s Fallen Star is a 70-ton house teetering off the roof of the Engineering School at the University of California San Diego (UCSD). Living and working in New York, London, and Seoul, Suh has created a body of work that consistently addresses tension-between home and migration, individual and collective, reality and illusion. Fallen Star, which is the most recent addition to UCSD’s Stuart Collection, expresses all of these dichotomies. From its seventh-floor access, a brick path curves through a garden to the front door. Suh torqued the charmingly furnished, 270-sguare-foot, single-room house, leaving visitors to negotiate and renegotiate their balance across the skewed space. His other recent public projects include Grass Roots Sauare, commissioned bythe Norwegian government for the city of Oslo, and Cause and Effect at Western Washington University in Bellingham, Washington, which also awarded him an honorary doctorate. “Perfect Home,” a solo exhibition of architectural pieces at the 21st Century Museum of Contemporary Art in Kanazawa, japan, opens on November 4 and runs through March 17, 2013. Sandra Wagner: You’ve explored the notion of home for some time, since your move from Seoul to the United Statesfor school. How have your notions of home, longing, and memory progressed from early works, such as Seoul Home/LA Home/New York Home (1999), to Fallen Star (2012)? Do Ho Suh: Moving to the U.S. was one of the most difficult, and important, experiences in my life. The idea of displacement, however, had been with me since my childhood. The traditional Korean-style house in which I grew up has always been a starting point and motif for my projects. It was built in the '70s, when everything in Korea was moving toward Westernization and new construction was very modern. My parents revisited the past when they constructed a traditional house. Every day when I left for school, I entered a completely different world. My parents’ home is a very special place, almost like a secret garden. It feels as though it exists in a different time. So, from a young age, I had a sense of cultural displacement from within Korean culture. This feeling stayed with me, and I think that it became accentuated when I went to the U.S. I've obviously been dealing with personal experiences in my work, and I use materials with which I am familiar, but my aim is always for viewers to reflect their own lives in my piece and not for it to be about my life. I think that’s why I felt very comfortable using an East Coast style cottage for this version of Fallen Star. |t’s the first time that I haven’t used my own home, but, for me, the notion of home is broad and general. Fallen Star doesn't feel different from my other projects-I've been working very slowly and steadily with the same idea. SW: At first you used transparent and transportable fabric with the idea of “walking the house”-disassembling a traditional Korean house and rebuilding it in a different location. Has anything changed with the solid, site-specific structures, such as Fallen Star? DHS: I always wanted to deal with solid materials and make a real house. The fabric pieces came down, at least in part, to practical concerns of creating something transportable. Also, I could not afford to make a house in real materials when I was at school, so I identified fabric that I could use on a 1:1 scale. For an art student or somebody just out of art school, the cost of making and shipping a house piece is prohibitive, so fabric was the perfect material to pack in my suitcase and carry with me. It was all related to my situation when I was making the pieces, and that has changed over the years. ﻿When the Stuart Collection project came about, their amazing program helped me to finally realize a much earlier idea in different materials. SW: Yourfabric works began as independent structures, such as Staircase (2003) and Reflection (2005-11). Why did you start making works that became part of other architectural structures? DHS: All my work is site-specific, so l never see my pieces as independent structures. One way or another, you have to deal with the site, both physically and psychologically. I think that the fabric pieces and Fallen Star at UCSD have the same intention. In Fallen Star, for example, two buildings are literally connected. Two different spaces are blended into each other. I have been focused on blurring boundaries in my work. When you use fabric, especially translucent fabric, a similar thing happens because of the boundary between my piece and the space around it. The piece is surrounded, encapsulated, by architecture-whether it’s a museum, gallery, or other space. The boundary between the two becomes more blurred because you can see the surrounding architecture through the fabric; it’s hard to define where the piece belongs. SW: You mentioned how your work interacts with viewers, how they can take what they want from it. What was the reaction to Fallen Star? Did international students on campus respond differently? DHS: I received a lot of comments from UCSD students and the university community, especially the foreign students. They responded immediately with, “Oh, I completely get it.’ I think the strength and intensity of the responses differed depending on where people were from. SW: You live in London now. Does that city have a different influence on your work than New York or Seoul? DHS: I don’t think living in London has changed anything in terms of my work yet, though it has made the notion of home more complicated. London is a completely different type of home, and I never had anything like it. Seoul is my childhood home, but it’s my parents' place. My New York home signified work; I spent most of my time there struggling to become an independent artist. My London home is different again, because it’s about having my own family and becoming a parent. Each home has served a difference purpose. It will take some time for the experience of these three homes, and having my own family in London, to influence how I think about life itself. One way or another, it will appear in my work, but it’s too soon to see it. SW: Net-Work (2010), a fishing net formed of gold and silver human figures stretched over a large metal frame, was installed on the shore in Japan, with waves washing some of the figures away What ideas were you exploring, and where is Net-Work now? DHS: That piece was made for the Setouchi International Art Festival, which is set around a series of islands. I wanted to make something inspired by a typical Japanese fishing village, something that blended into the landscape and seascape. If the fishermen aren’t out at sea, they’re mending their nets. That image inspired me. From a distance, Net-Work looks like any fishing net, but when you get closer, you realize that it is not an ordinary net. The most important aspects of this project were about collaboration and how the piece interacted with nature. It was partially assembled in my studio and then ﻿brought to Japan. For the festival, the local villagers formed a task force called Small Shrimps. About 20 older women and students volunteered to help to make this site-specific piece. We spent about a week assembling and installing it. I have a great picture of some of them sitting on the net and putting the panels together. It looks like a very ordinary scene from a fishing village, but when you see the figures, the people naturally became a part of the piece. Another important part was working with the raw elements, with nature. The show was installed from July through November, and during that period, the region experienced 30 typhoons. I had never dealt with the tide before-the waves and the wind animated the piece. I would have been quite happy if the typhoon had taken my piece away. That would have been a very beautiful gesture. But the organizer wanted to secure the piece, so there was a constant battle between us during the installation. The piece remained through the end of the festival, but some of the figures were lost when the waves hit it. It was quite challenging in that sense, because it was not ﻿like anything I had ever made. The piece went back to my studio. Seaweed and debris had collected at the bottom, and the chrome plating on the plastic figures had worn down, so it has a nice aged look. It was featured in my solo show at the Hiroshima City Museum of Contemporary Art, which just closed in October. SW: Gate-Seattle Version (2011), commissioned for the Seattle Art Museum (SAM), is quite different since it incorporates sound and visual projections on fabric, but it still reproduces the gate of your childhood home. DHS: Yes, that's the gate I had to pass through every day to go outside the house. SW: Viewers can walk through this small fabric gate, which hangs from the ceiling. A scrim extending from its outer edges creates a wall for the projections, which include images of branches being painted, birds flying, and an illusionistic recreation of a traditional Korean gate and house. What did you want to achieve with this multimedia approach? DHS: Even though people came to know my work through the fabric sculptures, my first solo show after graduate school in 1998 was a video installation at the NTT Intercommunication Center in Tokyo. So, working with multimedia was not completely new for me. I just didn’t have a chance to do more of it before. When SAM commissioned Gate, it gave me a great opportunity to deal with the museum as a context, a background, for my work. I looked through all of the pieces in SAM's Asian art collection and had a really long discussion with the curator, Catherine Roche. The piece came out of that ongoing dialogue. Back in Korea, I was trained as a traditional painter, so l have a little knowledge of Asian art history and theories. Using images from the collection, I made an animation and projected it onto Gate. It may look quite different from what I have done before, but it was something I had always wanted to do. SW: Can you describe how Cause and Effect (2012), the work at Western Washington University, addresses the idea of destiny and fate? Why did you think it would work well in the Academic Instructional Center? DHS: I realized that when it comes to public art, artists sometimes forget about who is going to look at a work and who is going to use the space. I’m always interested in making something that reflects the people who use the space. Cause and Effect was not a new piece-I’ve made different variations-but I felt that it was appropriate for the space and in the context of a university where students come from lots of different places to study. A university is a place for learning, and the piece is about what is inherited from your ancestors. Biology, genetics, history, and knowledge can all be passed on to you from previous generations. These things could be heritage or a huge burden; even if we’re not aware of them, we’re not completely free from them. They are something already written. Cause and Effect and Net-Work deal with similar issues. There’s a tension between you being an individual and being caught in a web of relationships or histories. These are things that you cannot see and are unable to escape from. SW: You’ve just returned from Norway where your work, Grass Roots Square, was installed in the middle of Oslo's Government Complex. In addition to a tree, thousands of small human figures in green-patinated bronze create a geometric pattern across the square. Can you discuss the project’s approach to issues of power and the idea of the collective versus the individual? DHS: It's a very good example of my interest in public space and what public art should be about. Some pieces, like Fallen Star and Cause and Effect, are more obvious than others, but they all challenge the notion of conventional public art through their orientation or materials. Pretty much every public art piece I’ve made is an anti-monument. Grass Roots Square is not on a pedestal, not at eye level. You can step on it and walk on it. That relationship between viewer and artwork is quite different from what usually happens in public art. Viewers have to have a completely different relationship with the piece, so their way of looking at art has to change. The Grass Roots Square tiles say that it’s not really about one individual, but about the people. It’s quite modest and humble. It’s low, with no center of focus, and I think that’s more democratic. The only component of the plaza that stands out is a tree that I planted; the sculptural elements are all very peripheral. They disappear into the rest of the plaza, and from a distance you don’t know what they are. The figures look like grass growing out of the flagstones, until you get closer and the work reveals itself. I got the idea when I was walking in a little village in Italy and saw grass between the pavement cobbles. I replaced the grass with little figures, some of whom support the flagstones. Some of the stones look like they are broken off where the figures appear in a packed formation. All of the figures are in different scales. 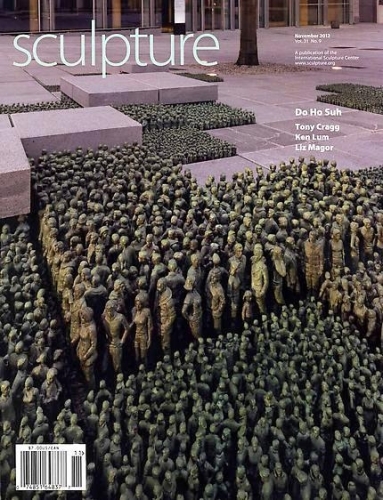 I used 500 different types of people, and the entire piece took 40,000 figures. All are cast individually and welded together. Grass Roots Square was possible in Norway because they have a strong public art program with a long history. My piece was quite impractical because of its fragility. If you start off worried about maintenance or vandalism, you can’t have a work like this. They were really open and brave to accept my proposal. SW: What are you doing for the 2012 Gwangju Biennale? DHS: I have two major new pieces for Gwangju. The city has an interesting public art event called Follies Project, which is about non-functional structures. They have invited architects from all over the world and artists like Ai Weiwei, and I was invited to do something this year. My project is a transportable hotel that parks between buildings. It’s a very small, one-room, fully functional hotel that requires a lot of generosity and volunteer support. It travels around the city, so guests can explore Gwangju from the inside. It’s a huge project, almost like a social sculpture that’s also public art. Again, it changes the notion of architecture, which is meant to be stationary-this is a building that moves. The site is the entire city, not any specific location. I’ve been collaborating with different teams of architects. One team is researching all of the alleyways and in-between buildings and creating a map of potential sites for the hotel. You also have to have permission from the people who use the neighboring buildings. The designs for the hotel were completed a couple of days ago, and we’re working with Kia Motors on the construction. We’re trying to bring a lot of people into this project. For example, if the hotel parks in a neighborhood where there’s a bakery, maybe the owners could donate breakfast for the person using the hotel. Perhaps someone could offer a traditional Korean meal, or maybe a nearby major hotel could provide housekeeping service. It’s going to be a challenge. I don’t know how this project is going to evolve, or if local citizens will be interested in it. Once it gets going, I imagine that it will have a life of its own. The other piece is called Rubbing Project. Sheets of paper will cover an entire room, and the paper will be rubbed with colored pencil or graphite to reveal what’s underneath. I’m undertaking this process inside three different rooms in three different buildings in the old part of Gwangju. Rubbing entire rooms will get the texture of the space before the paper is transferred into the biennale exhibition space. New development in Gwangju is changing the center of the city. The derelict buildings that I have chosen possess untold stories. I am interested in how we remember, the process of historicizing and how a personal story becomes history. My hope is to reveal hidden histories with the gentle caressing gesture of rubbing before these spaces and their stories disappear.